Even before the latest Star Wars movie was released, Bear (7), has been fascinated with all things Star Wars. He's never seen any of the movies, just the cartoons on tv. Nonetheless, it's a constant theme for play around our house. 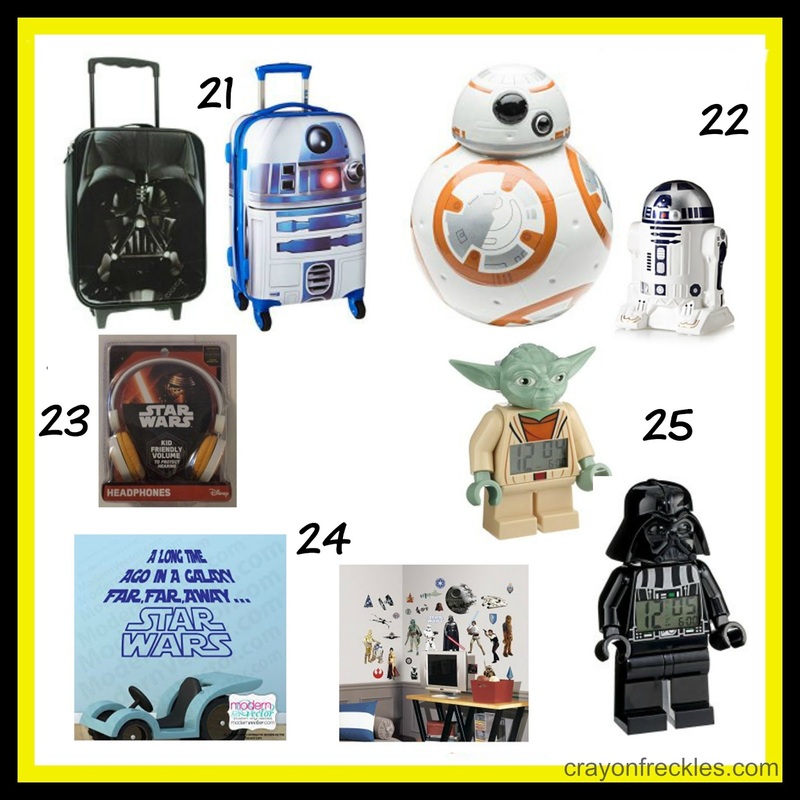 So with the holidays coming up, I thought I'd put together a Star Wars gift guide to share some of the more unique Star Wars items I've found. 1. Help your child create their own cuddly Star Wars buddies by using the patterns in the Star Wars Crochet Book . 2. There are tons of fun and easy crafts for kids in The Star Wars Craft Book. 3. The Star Wars Shrink N' Play Activity Play Set gives homage to the Shrinky Dinks that many of us played with when we were kids. 4. Origami is a fun and calm activity to fill up some time. How fun is this Star Wars Origami book that provides directions to make all those favorite Star Wars characters? 6. Making paper airplanes is a classic time filler and is great because you don't need a lot of extra supplies. Using the Star Wars Folded Flyers Craft Kit kids can make their own version of their favorite ships from the movies. 7. The Star Wars Felt Craft Kit is an all inclusive kit that includes everything needed to make ten characters out of felt. 8. Aqua Beads are similar to the pearler bead sets that can be placed into patterns and then fused with an iron. Only they are fused together with water, which makes them 100% kid friendly. The Star Wars Aqua beads set comes with patterns so kids can make their favorite characters. 9. Spice up your Mr. Potato Head collection by adding the evil Darth Tater and his Spudtrooper or the hero, Luke Frywalker . 10. Play Doh is a classic favorite. But the Star Wars Activity Kit and Millennium Falcon Kit bring the fun by turning the Play Doh containers into Star Wars "can heads" characters that can be played with. 11. The Star Wars Magnetic Activity Play Set is great for keeping little hands busy in the car, at church, or a home while you're cooking dinner. 12. 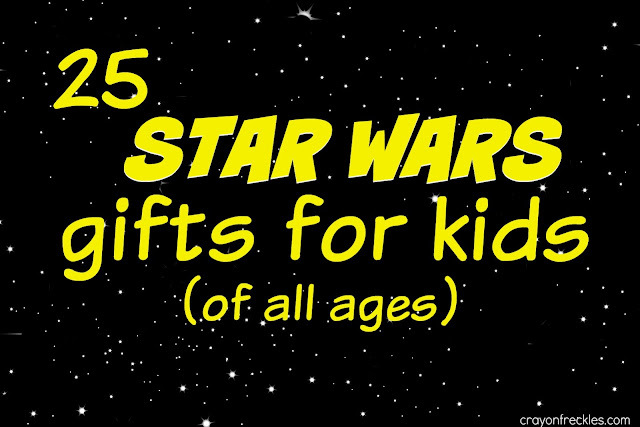 Of course, a Star Wars LEGO set has to be on this list. There are so many fun and different sets available in a variety of sizes and price ranges. 13. 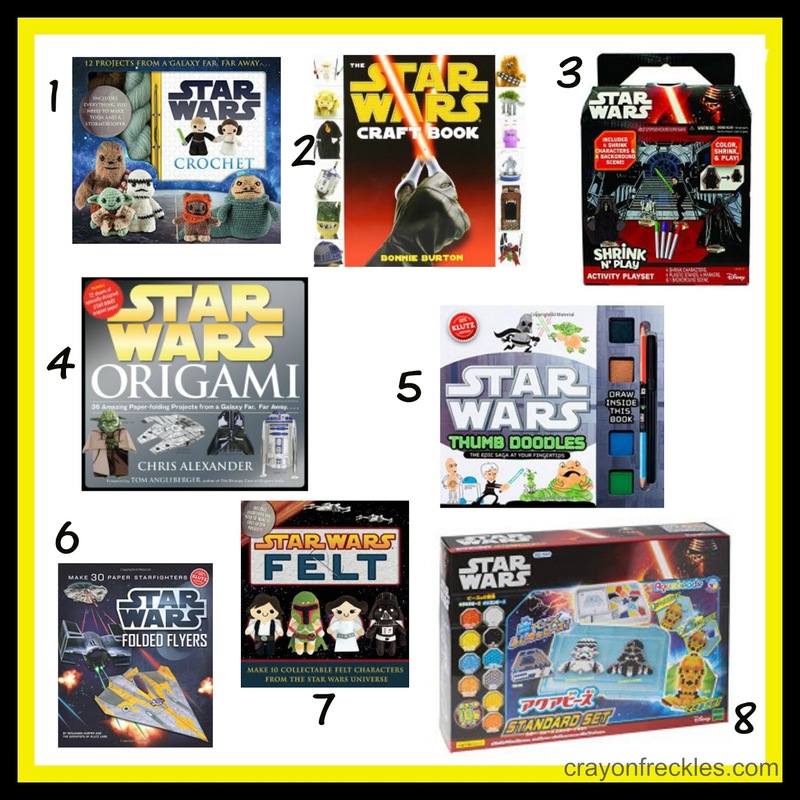 Have a Star Wars themed family game night with Star Wars versions of Chess, Battleship , or Sorry!. 14. Need more games? Then grab the Star Wars The Force Awakens: 6-in-1 Game Collection which has bingo, dominoes, and other games. 16. Stir up some Star Wars kitchen fun making Wookiee Cookies and other out of this world recipes from The Star Wars Cook Book . 17. The 5-Minute Star Wars Stories makes a great addition to your young reader's bedtime routine. 18. Get your kiddo snuggled up with a fuzzy Star Wars Fleece Throw . 19. 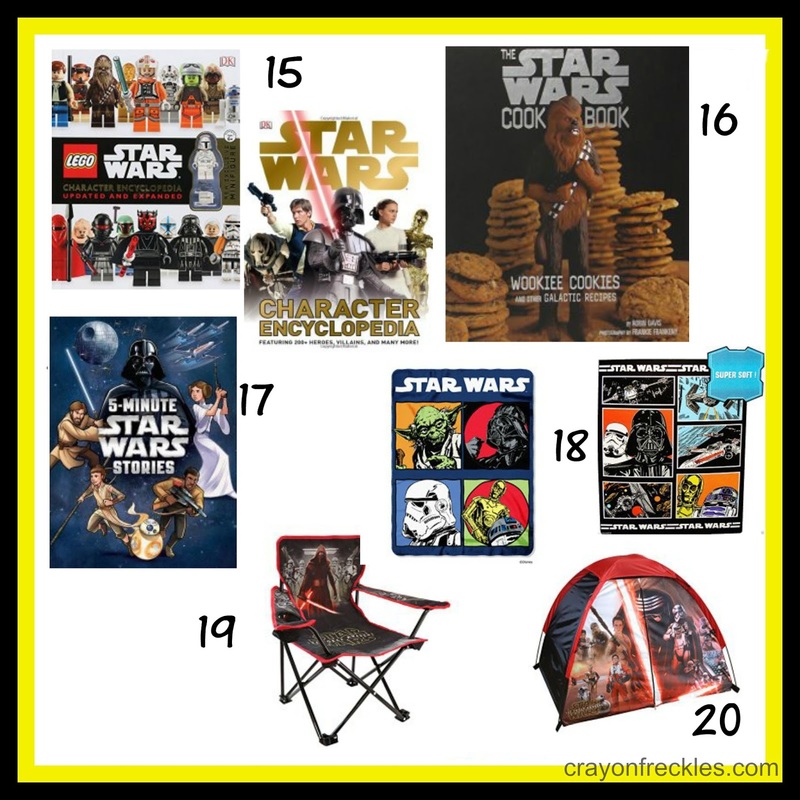 The Star Wars Camp Chair would be perfect for young fans to use around the fire pit. 20. 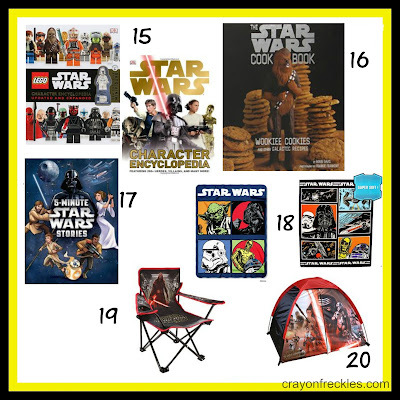 This Star Wars Tent could be used inside for fun sleepovers or outside for playtime. 21. The kids will be begging to go to Grandma's for the weekend if they had this luggage! The Darth Vader Pilot Case is pretty cool, but no lie, I'd even use the R2-D2 suitcase . 22. Teach saving money the fun way using a BB-8 Droid Bank or a R2d2 Bank . 23. These Star Wars headphones are adjustable and have a limited loudness, so they're safe for kiddo's hearing. 24. Vamp up your child's bedroom walls with this awesome vinyl Star Wars quote or character decals. 25. Let your Star Wars lover wake up in style with a Lego Darth Vader or Lego Yoda Alarm Clock . 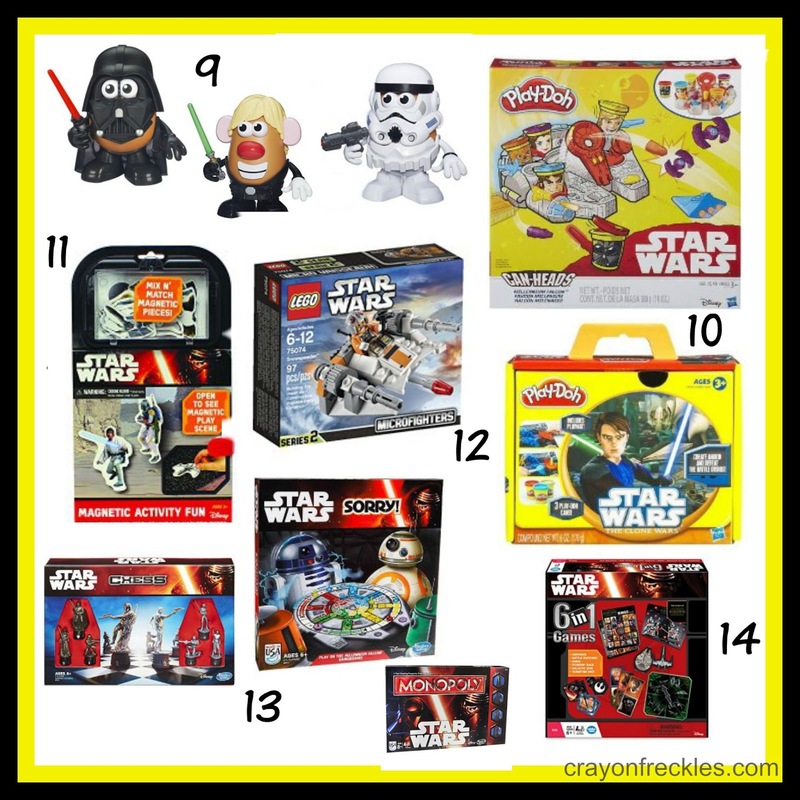 There's soooo much cool Star Wars stuff out there... products for children with a variety of interests. So many of these could even be given to an adult Star Wars fan, don't you think?